As the UN General Assembly began a new effort to break the deadlock over the reform of the Security Council, Pakistan warned against any attempt to increase the 15-member body's permanent members.“Permanent membership for a few individual states will deny the opportunity for equitable representation to the rest of us,” Ambassador Munir Akram said in the course of a wide-ranging debate on Security Council reform. Practically all member states agree on expanding the membership of Council, but they are sharply divided on the category in which the increase should take place and by how many. 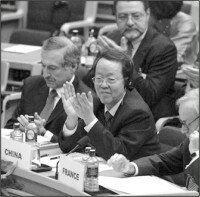 In July 2005, India, Brazil, Germany and Japan, the aspirants to permanent seats on the Council known as the Group of Four, called for boosting its membership from 15 members to 25, with six new permanent seats without veto power and two for the African region as well as four non-permanent seats. The Italy/Pakistan-led “Uniting for Consensus (UfC) group opposed any expansion of the permanent members on the Security Council. It sought enlargement of the council to 25 seats, with 10 new non-permanent members who would be elected for two-year terms, with the possibility of immediate re-election. The African Union's called for the Council to be enlarged to 26 seats, one more permanent seat than the G-4 proposal. Its proposal for six new permanent seats was the same as the G-4's, except that it would give the new members veto privileges. But none of the three proposals had the required two/third majority in the 192-member Assembly and therefore were not pressed to a vote last year. The Pakistan ambassador said the central question was whether objectives could be achieved by enlarging “the coterie of the few”, or increasing general membership, adding that the latter was the only feasible approach. That was the basis for Pakistan's opposition to increasing the number of permanent members. Ambassador Akram said he was unconvinced by the argument that the erosion of Council's credibility would be resolved by adding more permanent members. Problems would only be compounded by more States seeking to protect national interests in the Council's work. Only a formula that included an increase in the non-permanent members and rotation could provide the means for equitable representation, he said. The Uniting for Consensus approach was sensible and realistic. It provided for rotation and a longer-term presence of states. Such arrangements could accommodate regional and political groups, such as the Organization of Islamic Conference (OIC), which had interests to promote in the Council. Since, under any proposed scheme, new seats would be allocated to regions, countries of those regions should determine the nature of that representation, the Pakistan ambassador said. Such decisions should not be left to “a few major powers”. Equitable representation would make little sense if a seat allocated to a region would be permanently represented by one country, he said. Africa's demand for a permanent seat was one for an entire region. The African model of regional representation could encourage agreement on reform. Recalling that the reports of facilitators, who were appointed by the assembly president to propose solutions, had concluded that none of the past proposals had garnered the required support. Those reports, he said, had constituted significant progress on the reform issue. To achieve further progress, he called on States to build on their recommendations. On the negotiation process, the ambassador said, was disturbed that professions of flexibility had been accompanied by the reiteration of unacceptable demands. Pakistan supported negotiations, he said, adding that were intended to lead to agreement, not a vote. To ensure success, they must be carefully planned. Four elements should serve as parameters for talks, Ambassador Akram said. First, discussions should take place within the framework of the Open-ended Working Group. He opposed “restricted conclaves” that excluded States. Next, talks should build on progress achieved at the sixty-first session. Submission of unilateral proposals could retard the process.